Topics: Citizen Corps, Foreign Language Docs, Kids, Lepc, and Mitigation Plan. Age: The domain is 17 years and 6 months old. 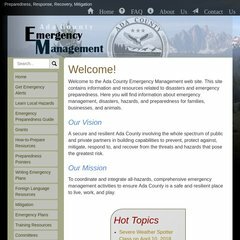 accem.org Four Phases of Emergency Management - Ada City-County Emergency ..
On average 2.20 pages are viewed each, by the estimated 26 daily visitors. Its local IP address is 216.251.32.98. ns2.spro.net, and ns1.spro.net are its DNS Nameservers. Internetnamesforbusiness.com Florida is the location of the Apache server.